Agency plans to dramatically expand its pre-screened passenger security program in the coming months, throwing open online enrollment and expanding the number of airports where travelers can go to provide biometric data. Starting later this year, any U.S. citizen will be able to apply online and visit specified enrollment sites to provide identification and fingerprints for TSA’s Pre Check program. The agency did not specify a date for the start of the online applications process, saying only that it would be later this year. It also plans to expand to additional enrollment sites nationwide, although it did not immediately specify those sites. Pre Check membership has so far been limited to the members of five major airlines’ frequent flyer programs, including Alaska Airlines, American Airlines, Delta Air Lines, United Airlines and US Airways. According to TSA’s website, Virgin America plans to participate in the program later this year. 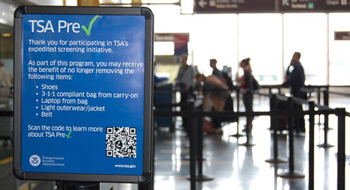 TSA said it would begin the expansion at two initial enrollment sites where biometric and biographic information would be collected — Washington Dulles International Airport and Indianapolis International Airport. The Pre Check application program requires a background check, fingerprints, and an anticipated enrollment fee of $85 for a five-year membership. Once approved though Pre Check, travelers can bypass TSA’s regular security lines to specified express lines where they can keep their shoes and belts and get through to their flights faster. They may still be subject to random TSA screening, however. According to TSA, to date 12 million travelers have used the program at 40 airports nationwide. TSA already accepts participants in Custom and Border Protection’s Global Entry clearance program that allows international travelers to swipe their passports at kiosk checkpoints. The CBP program costs $100 for a five-year enrollment and requires a background check, fingerprinting and a travel questionnaire.